Harald Hoven is coming to Highland Hall! Garden Greetings from the Annex! Yesterday, we had a break from the rain! First thing in the morning, I threw on my boots and got out in the garden. Today I was fortunate enough to garden at the Annex in the Sepulveda Basin Community Garden in Encino. The Annex is supported by the Highland Hall Garden Gnome Society and is an extension of the teaching garden at Highland Hall School. Thanks to the committed benefactors at the Garden Gnome Society, there is a five-plot vegetable and flower garden dedicated to promoting the health and happiness of the whole community. 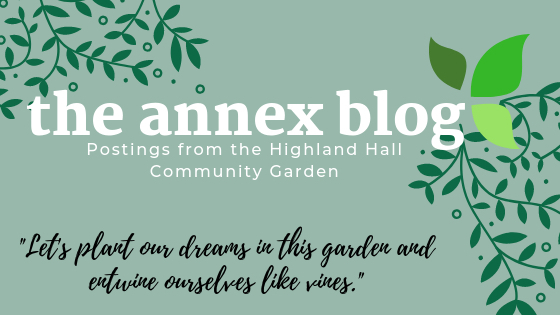 The Annex also hopes to promote the ideals of our wonderful home school Highland Hall and spread the word about the benefits of a Waldorf education and biodynamic gardening. Perennial Purple Basil, sometimes called “Pink” or “White” perennial basil. Ocimum basilicum ssp. Through my experiences in both private and public gardens as well as my own home garden, I have come to believe gardening is deeply healing…I’ve been enjoying its therapeutic effects for years! After all, gardening is all about growth, isn’t it? And to that end, gardening, and especially the power to grow your own food, should be accessible for all. At the same time, I believe that we have a responsibility to do what we can to gently steward our environment while enjoying its bounty. In the powerful words of the poet Maya Angelou, “Do the best you can until you know better. Then when you know better, do better.” Simply put: the more we know, the better we can do. Therefore, education is vitally important. Biodynamic farming, in particular, is committed to doing what is best for the greater, larger environment and promotes a sacred respect for nature’s wisdom. I have great admiration for the work Highland Hall has done in these areas. With so many benefits you can understand why I’m always looking for opportunities to share my love of gardening and get all our hands in the dirt! 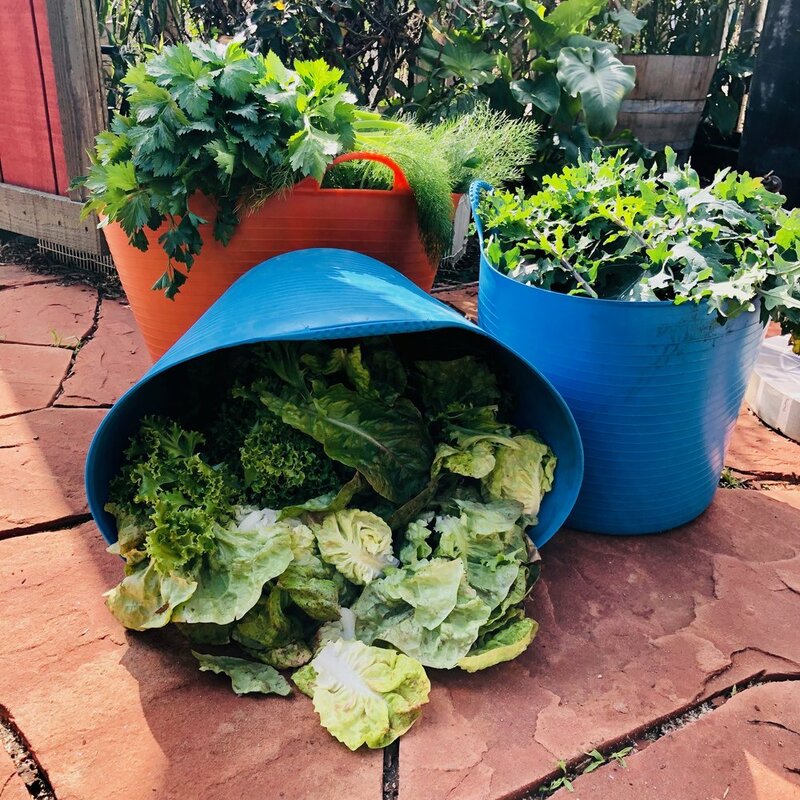 I hope through regular posts I can pique your interest in both the Highland Hall school garden and the Annex community garden, as well as give you some tips and tricks for your home gardens. 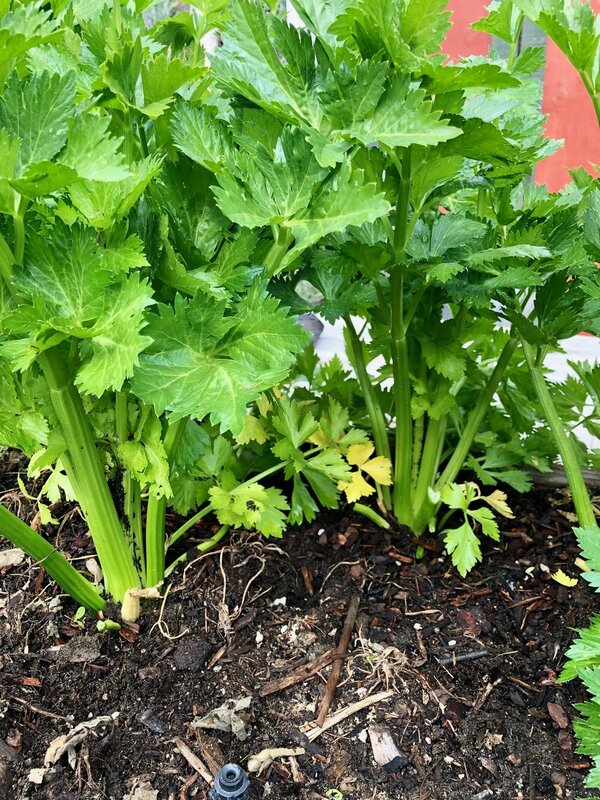 Celery is one of my favorite garden vegetables. Do you know garden celery is more of a seasoning than a crudite or cracker substitute? Celery is full of salty flavor and should be added to soups and sauces like onion or shallot or garlic. Eaten right out of the garden, it is a refreshing treat but it is stringy. I have kids give it a chew to experience the flavor…it’s like nature’s jerky! Today’s dirty work included a general cleaning up of the garden space…with all this rain there are lots of “exciting developments.” You may have noticed at your own place that trash cans (and really any receptacle left outside) has filled with water. If possible you can save this rainwater but sometimes it is too much to reasonably keep or it has filled a receptacle that wasn’t really clean to begin with. This is not really a fun job but it’s important, so pull on some old clothes and tip that excess water out (if it cannot be saved). It’s always good yard maintenance to not allow standing water to collect and really this situation only gets worse if ignored. There are so many enjoyable garden tasks to get to (Spring is breathing down our necks!) so let’s get this messy one out of the way soon. Normally pill bugs (aka sow bugs) and earwigs (aka pincer bugs) live happily deep in our soil eating rotting materials and they are beneficial! But if we leave too many rotting materials on top of the soil, it draws these insects (and others like snails and slugs) to the surface and then they may decide our beautiful strawberries look like a good snack. So let’s not encourage this situation and keep the tops of our beds free of rotting leaves. Note: Mulch and compost are different than rotting leaves and do not attract these insects. Mulch is generally made of wood chips and so is not actively rotting and compost is already broken down to the point of not attracting pests (although they may live in our compost piles). The point is not to increase their populations inadvertently by providing food sources or hiding places. Rotting leaves can definitely be added to your compost bin once you are done cleaning up. Another result of all this rain: my how the plants have GROWN! I spent a good amount of time harvesting and you should give your plants a good harvest too. Harvesting is the most important task in the garden and there will be a harvest blog coming up soon. We need to keep harvesting regularly so we will be ready to bid adieu to our winter veggies…as I mentioned Spring is breathing its cool breath down our necks…and we will soon need to pull out the winter veggies to make room for the tomatoes and squash! For now, enjoy your home garden by harvesting some cut flowers and fresh herbs and veggies, and trim lavender, sage and rosemary for sachets. We had a huge yield at the Annex and you will see some of our Annex harvests at your Farm Table at Highland Hall. 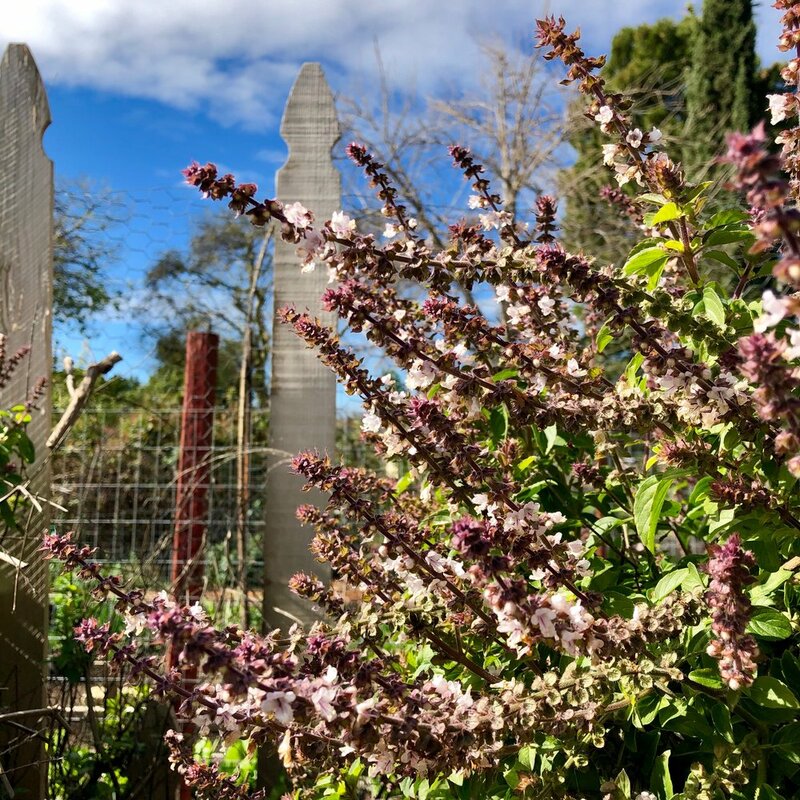 Important news: we will be having the Highland Hall Spring Gardening Workshop at the Annex Garden, 16633 Magnolia Blvd, Encino, 91406 on Sunday, March 24th, so mark your calendars. There will be many more exciting future events at the Annex Community Garden as well. We look forward to hosting you! Thank you Highland Hall and Garden Gnome Society for your support and your warm embrace. Welcome to the World of Salve Making! Making salves (rhymes with "calves") is a simple process that requires some time and a little mess, but the results are well worth it. Not only will you be able to use the salve for yourself, but you’ll be making enough that you can share with family and friends, spreading the love of healing herbs far and wide. 1. Make your herb-infused oil. 2. Use the oil to make a salve. In the simplest terms possible, this step is basically putting dried herbs in a jar, covering them with oil, then letting them sit on a windowsill for six weeks. Then you strain the herbs out, and you’re done! c) Crush or chop your herb leaves, but leave your flower petals whole. d) Use an organic carrier oil that suits your end product: olive oil is fine for bodily applications, sweet almond oil is better for cosmetic uses, jojoba oil is great for any use and has a long shelf life. e) Cap your jar tightly and place in a warm place away from direct sunlight. f) Shake the jar daily, or whenever you remember. The herbs should always be submerged in the oil; if the oil level goes down (herbs will absorb it), add more oil. g) Allow your herbs to sit for at least six weeks. Traditional herbalists recommend putting up oil extractions and tinctures on the new moon and finishing on the full moon occurring six weeks later. h) Pour the oil through a strainer lined with cheese cloth, squeezing the cheesecloth to get out all the oil. i) Store in a clean jar or bottle in a cool, dark place (amber glass works well to protect from light that will shorten the shelf life of the oil.) Use the oil as is, or go to step two to make salve! In this process we’re basically combining the oil with beeswax (or Carnauba wax for a vegan salve). The beeswax helps solidify the oil and makes it easier to apply. 1. Add beeswax to a pot or double boiler and melt on the lowest setting possible. Be careful - it burns easily! 2. Whisk in oils until combined. 3. Allow to cool slightly, then add essential oil and vitamin E oil. 4. Quickly pour into glass measuring cup. 5. Pour into glass jars and allow to cool completely. 6. Cap tightly and store in a cool location. If stored in a cool location, your salve will last one to three years. If you would like a softer salve, use less beeswax, for a firmer salve, use more. You can use a combination of oils, or just one kind. 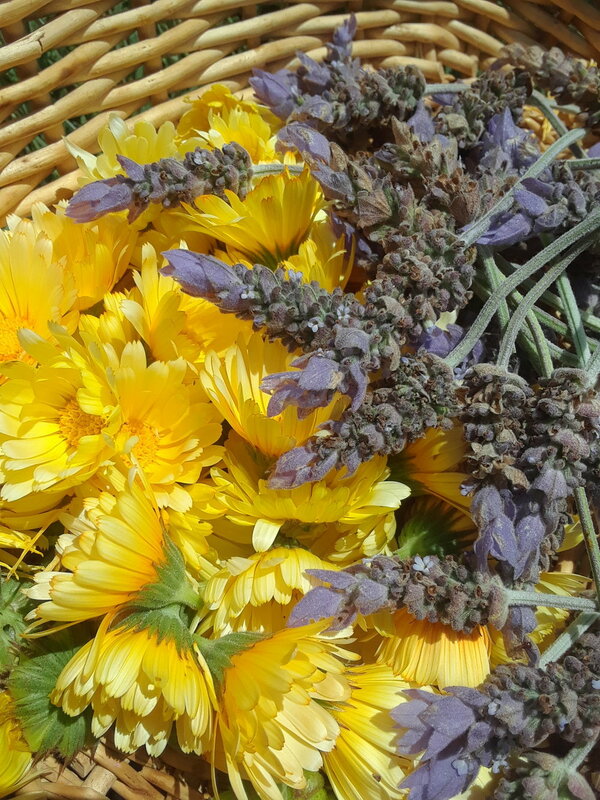 Some popular choices for herbs to use in a salve include: arnica flowers, calendula, chamomile, echinacea, comfrey, lavender, plantain, and yarrow. 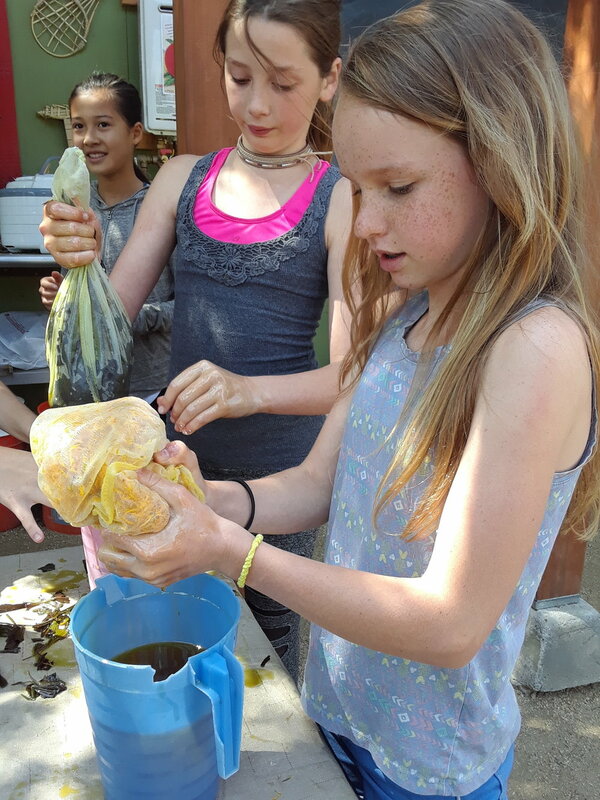 Thank you to the Highland Hall Fifth Grade for their help in demonstrating how to make salve! So you'd like to try your hand at gardening? Wonderful! But maybe you're not quite ready to commit to building a raised bed or digging up your lawn? The solution: container gardening! Container gardening is a great way to take baby steps into the world of gardening. Small commitment, easy to look after, and the potential to have wonderful fresh veggies, flowers, and herbs right outside your door. No more buying a whole package of herbs just to use a few sprigs! Container gardens are also less prone to insect infestation, especially from ground-dwelling friends. And pots are moveable! If you or the plants don’t like where they’re growing, you can push or pull them to happiness. So where to begin? The first step is to consider the season. In SoCal we have two: one month of winter, and the rest is summer. Winter (and surrounding months of summer-like weather) = greens (lettuce, spinach, chard, collards), peas, herbs (not basil, sorry), some flowers (cosmos, calendulas, zinnias, sweet peas), root vegetables (carrots, beets, potatoes), strawberries*, more greens. Summer = tomatoes, peppers, beans, squash*, melons*, herbs, any flowers. * Melons and squash need a very large container, can be difficult to grow, and are prone to insect troubles; I would try something easier to start. Strawberries are also difficult to grow here, so I would try something else first. There are some veggies that simply aren't suited to our growing climate, even in the winter. I put most brassicas (broccoli, cauliflower, cabbage) in this category, as our winters are often too warm. They also don't make a lot of sense for containers, as they take up a lot of space and you only get one vegetable. Better to use that space for greens, which will continue to grow through the whole season if you only pick the outer leaves. So, next step is to consider your light, as in how much sun hits your growing space. If you have partial sun (4-6 hours a day) or shade (less than 4 hours), then your options are somewhat limited. In general, greens and herbs prefer partial sun, and can even grow in less light than that. 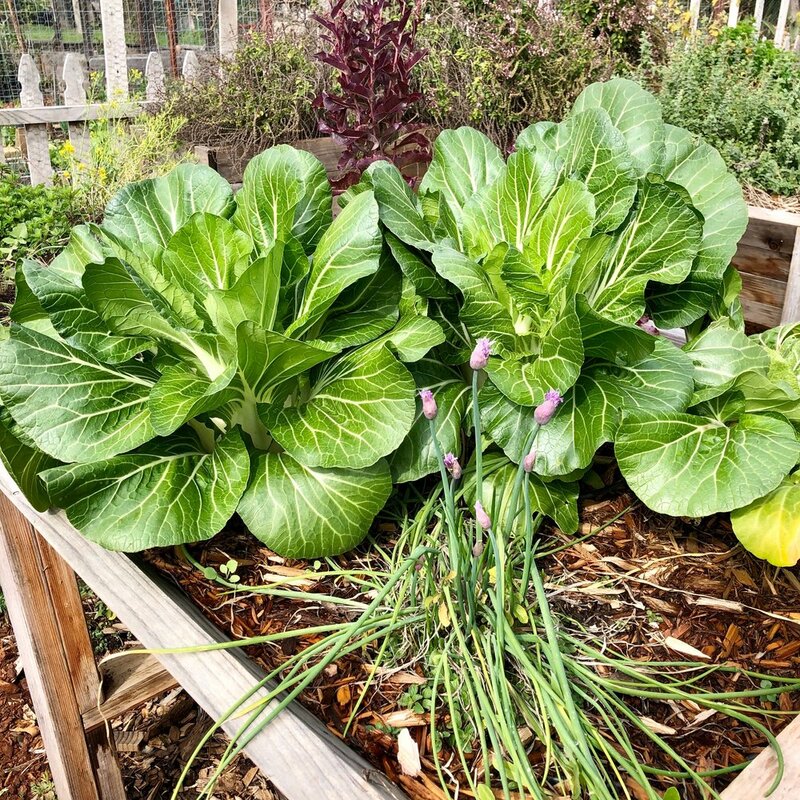 Greens are great in winter months, as the weather (should be) cool enough that they won't bolt (grow flower stalks), as they will in the summer. 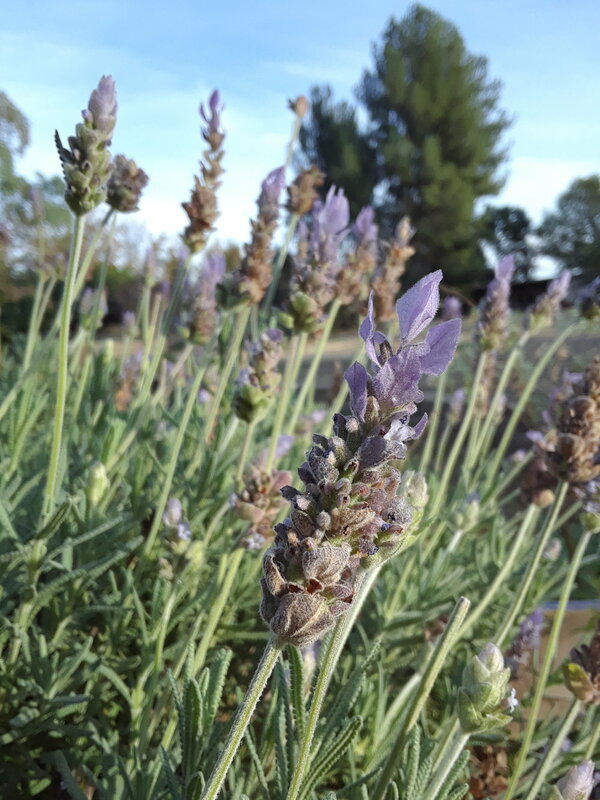 In the summer, herbs are great in partial sun or even mostly shade. Full sun (6+ hours) in the summer lets you grow vegetables like tomatoes and peppers, but this can mean scorching. You may find yourself looking for partial shade for the hottest part of the day, or creating it with shade cloth. Another factor is wind exposure. 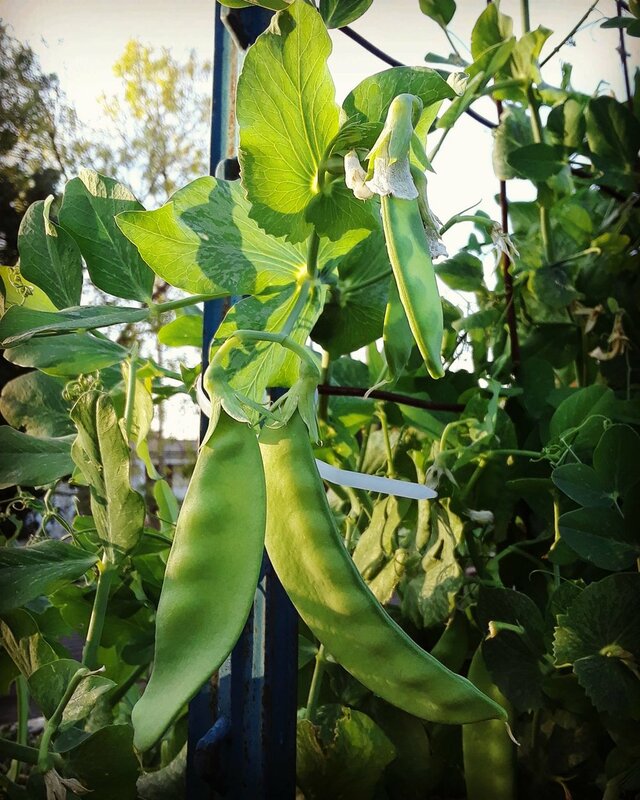 If you plan to garden in a spot that is exposed to our strong Santa Ana winds, be prepared to protect any taller plants, especially tomatoes and peas. You can stake them or have a very sturdy trellis. Next time we’ll talk about plant selection, so stay tuned! Welcome to the world of birding! Over the last few weeks the Fourth Grade has been getting to know some of the animals that live with us, but who hover just out of reach. After the grounding work of the Third Grade curriculum, Fourth Grade moves on to study our relationship with the animal world around us, culminating in their Man and Animal block. In the garden, we use this opportunity to look up at the creatures who work and play alongside us every day. 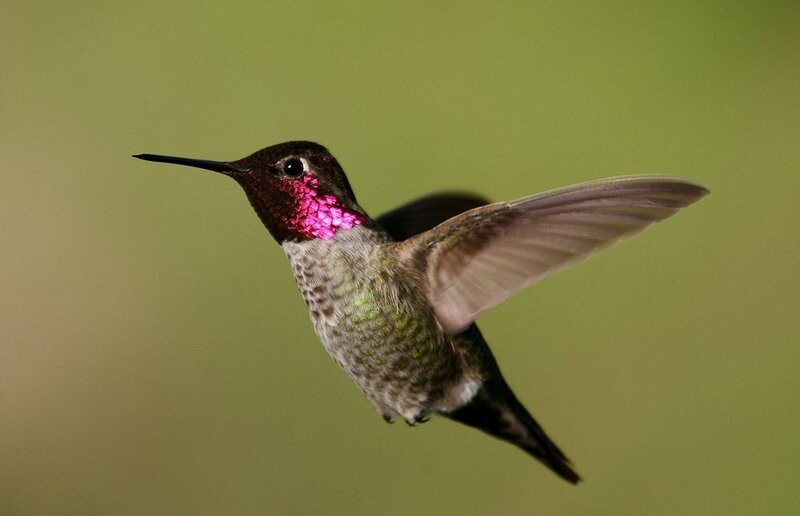 February is a great time for bird watching in our region. The deciduous trees are bare, allowing for easy spotting and clear views. It's also a great time to see migratory birds moving through our area, making their way north after a winter in the sun. February also finds local birds looking for mates, which means lots of fun activity like nest building and dynamic mating behaviour. In preparation for bird identification, the kids practice observational skills by playing Bird Spy Bingo. They then list all the birds they know and sort them into major bird groups to help differentiate them by shape and physical characteristics. They learn that bill shape relates to the type of food the bird eats. They then learn to identify some of the birds we see on the farm. Students work on developing their observational skills during these exercises, including patience and remaining quiet (parents: you're welcome!). While looking for feathered friends, students also learn about their natural environment indirectly. They start to notice things like leaf buds emerging, different ways that branches grow, and what kinds of trees the birds prefer. Many questions arise in the course of each class, leading to fun (and occasionally silly) discussions. Garden gloves are so much fun! Work parties are a marvelous thing! They not only help us make serious progress on farm projects, but they also help in the invaluable work of building community. Throughout the school year, students from all grades help with work on the farm; however, we only have each class for 45 minutes at a time, which includes set up and clean up, leaving us with only a short window of time for actual work. For some projects this isn't a problem, but for others, we need more time and focused attention. And some jobs, like building a pergola, are simply beyond what we can ask of the students. This is why our wonderful volunteers are so precious to us. Last weekend we had our first work party of the new year. It was a very windy day (our breakfast almost flew away! ), but lots of families joined us to make great things happen. Ms. Kelley has been leading a huge effort to sheet mulch the entire lower field this winter. The single greatest villain that we battle on the farm is Bermuda grass. It's highly invasive and takes over any space it can, burrowing deep into the soil and sending out countless runners. It's the cockroach of the plant world. Sheet mulching is the most effective way of dealing with this pestilence, though even then we still need to keep up with the insidious invader. Sheet mulching (also known as lasagna or no-till gardening) is a permaculture technique that involves layering soil, manure, cardboard, and mulch (wood chips). These layers not only create a barrier between the Bermuda grass and the sun, but also help build healthy soil underneath. Eventually the cardboard and mulch will break down and further feed the soil with organic matter and minerals. Even the smallest hands were able to help, working alongside their parents and friends. Another big project we tackled on Saturday was weeding and mulching the big swales beside the greenhouse. Two years ago we dug trenches (swales) into the hillside above the lower fields in an effort to capture rainwater before it had a chance to flow into the lower parking lot and sewer system. Along the swales we planted a variety of plants, including fruit trees, herbs, and artichokes (the artichokes love being in the swales!). The plants are doing very well and the project has been hugely successful. This Saturday we worked on mulching the last section of the swales, to beautiful effect. 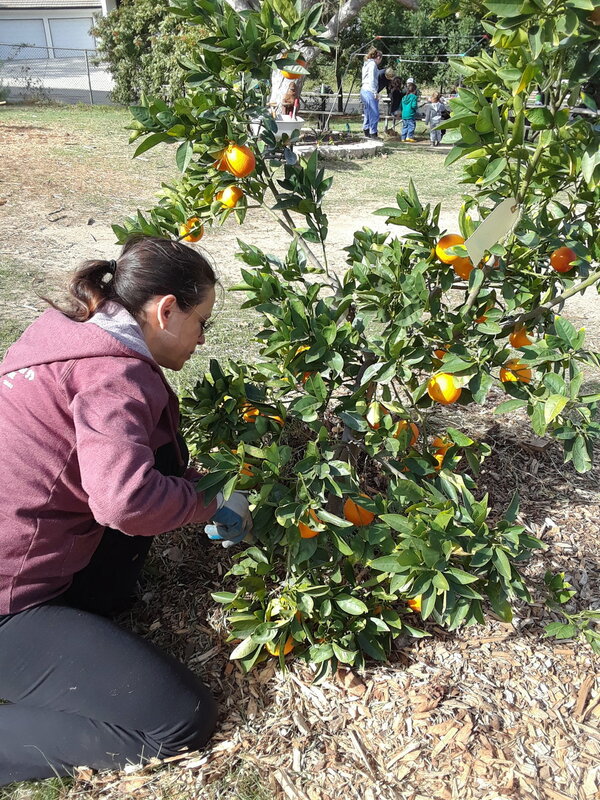 Volunteers also worked on weeding and mulching around citrus trees in the orchard, a challenging task given how deep the Bermuda grass roots go! But they triumphed and the trees look so happy now. We also started on the large task of pruning fruit trees in the orchard! The Fifth Grade has been working in the orchard over the last few weeks, but there are more trees than they can manage. Trees benefit from regular pruning, especially fruit trees, so we want to do our part to help them live a long and happy life on the farm. Plus, we love fruit. Thank you so much to all who help us in this great work, we appreciate you and everything that you share with us! 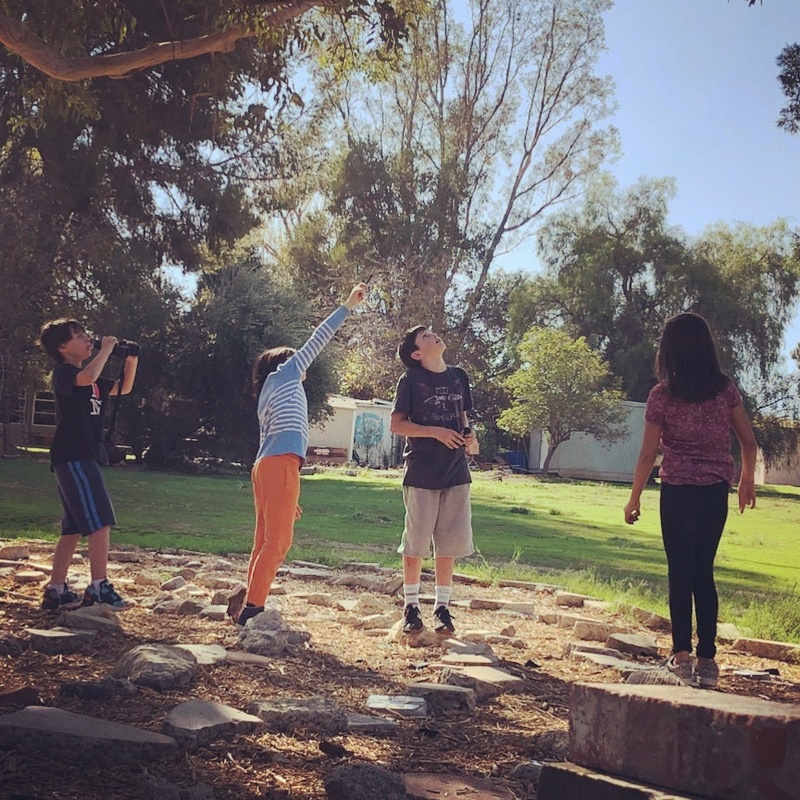 The aim of the Third Grade curriculum is to teach students how to live in the world, "to connect themselves consciously with their surroundings." 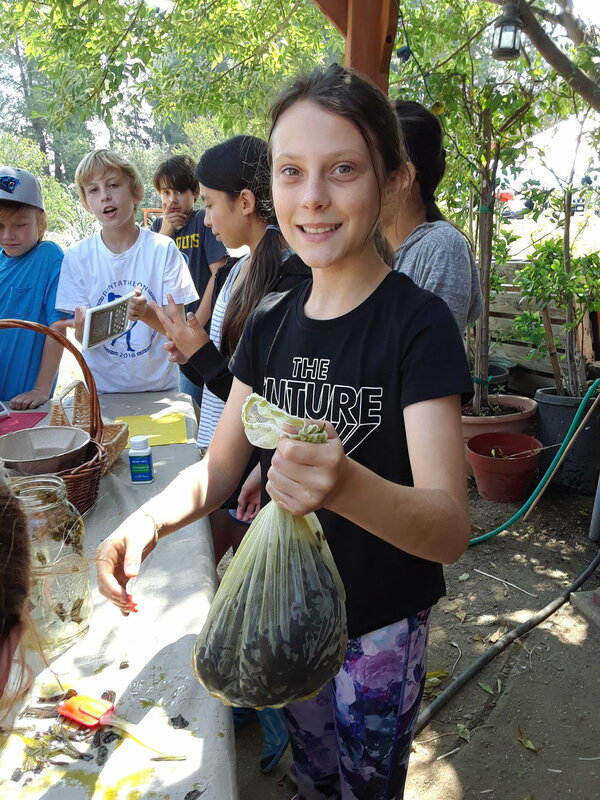 Throughout the year the students learn the basics of structure building, fiber and clothing, and growing and cooking their own food. The goal is that with these skills as a foundation, children will feel grounded and capable as they leave behind the dreaminess of youth and their feet meet the earth. 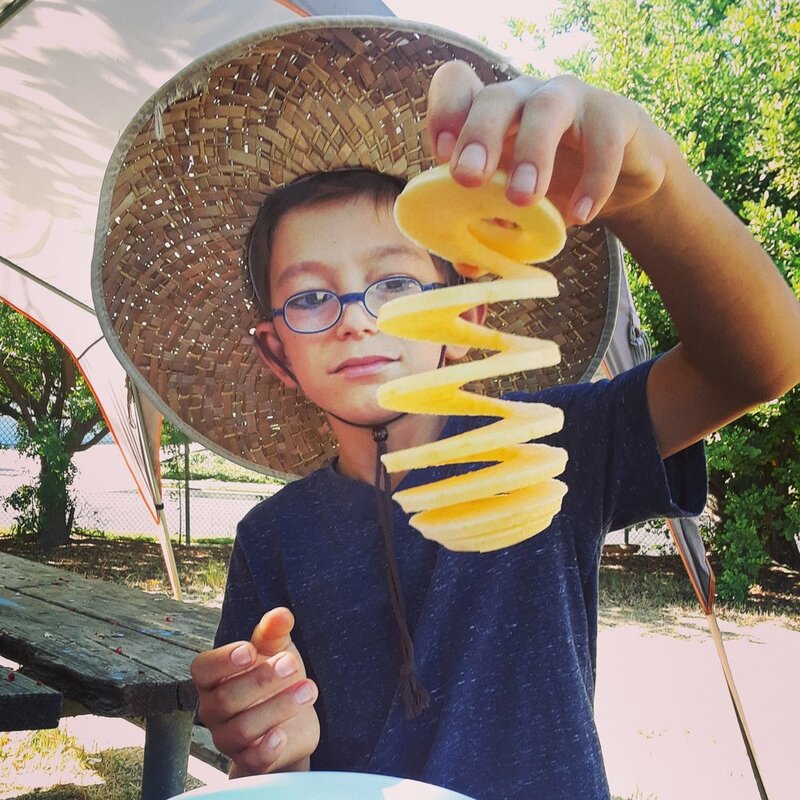 Bridget Kelley, our beloved biodynamic farm teacher, has developed this curriculum over several years of working with classes and learning their needs and abilities. 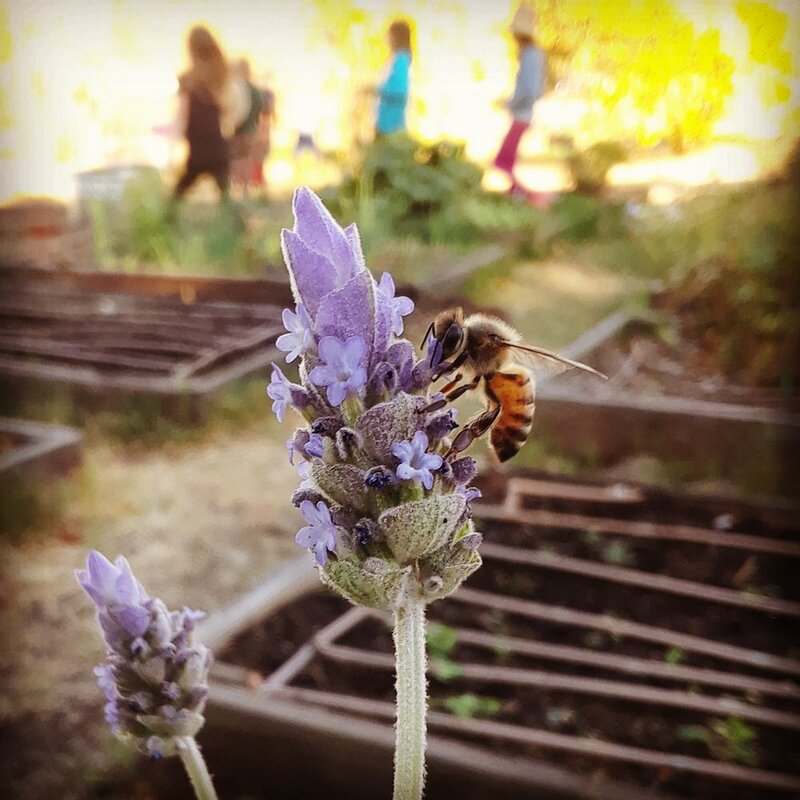 In the garden, the Third Grade students learn to till the soil, distinguish between different kinds of grain, and learn about the relationships between plants, animals, and human beings. Their work starts in the early summer of their Second Grade year when they help prepare row beds for planting grains. They plant grains like buckwheat and corn, which they harvest when they return to school in the fall. 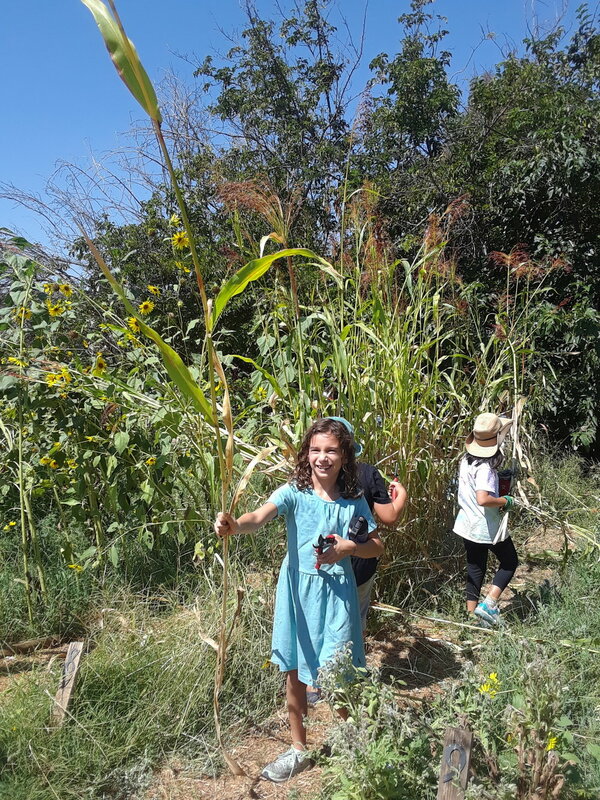 This year the Third Grade grew special corn that they made into brooms for the classroom. The class also planted wheat, which they will harvest at the end of the school year. Their work will include threshing, winnowing, and grinding the grain into flour. The flour will then be used to make pizzas that will be baked in our outdoor pizza oven! Cotton and flax are two more crops that the students planted recently. Once grown, the fibers will be processed by the students with Ms. Lewis, their handwork teacher. They've also been working hard planting fall vegetables like kale, sugar snap peas, garlic, collards, beets, and carrots. In spring, they will plant tomatoes, cucumbers, peppers, and basil. Throughout the school year the class works hard at planting, hoeing, raking, amending, weeding, and mulching. Proper use of tools and appropriate garden etiquette is emphasized in every class. They helped build several large biodynamic compost heaps and led our school composting program by gathering compost from the lower classes each week and incorporating it into the compost piles. Honey bees are marvelous creatures with a simple but effective community structure. Each hive has one queen who is responsible for laying eggs. She can live up to three or four years! There are many worker bees as well, all of whom are females who do not reproduce. During summer they live for several weeks, while in winter they can live up to a few months. The only males in the hive are drones who are there for mating purposes. They don't live very long. For about the first 20 days of a bee's life they stay inside where it's warm and cozy, cleaning cells and feeding other bees and larvae. Before these young bees can leave the hive to collect nectar, pollen, water, and materials to make propolis*, they need to figure out their place in the world. Their first flight into their greater habitat is called their orientation flight. 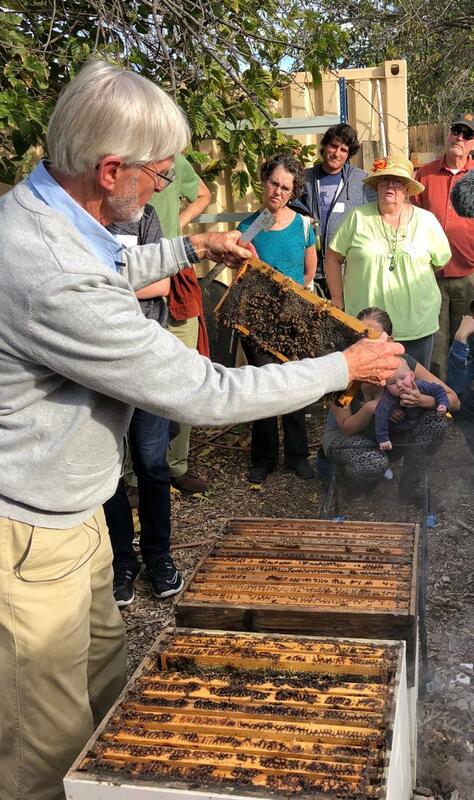 Our friend, Gunthur Hauk, getting to know our bees. It's an exciting time in a bee's life. They pick a warm, windless afternoon, if possible, to take their first flight. They're seeing their surroundings for the first time, getting to know the feel of wind and sun, what their home looks like from the outside. As they test their wings, they make short zig zag flights back and forth to the hive. As they feel more comfortable, they make greater circles, moving a little further away from the hive each time. They take note of the landscape and landmarks as they go, cues that will help them remember how to return to the hive after harvesting materials. And then they poop. Gunther Hauk, showing the inner workings of the hive to workshop participants. Bees are very clean creatures, and until the orientation flight, the young bees have not yet had a chance to relieve themselves (20 days!). So they take advantage of the great outdoors. Imagine the relief. After 15 to 30 minutes of flying, they return to the hive for the day. The position of their nest entrance is very important, which is why we always make sure they have a clear flight path to their front door. After a few days of orientation flights the bees are ready for real foraging flights. They will bring back pollen and water for the next generation of honey bees, little creatures who are so very important to our way of life. * Propolis is like bee glue, made of sap or sticky plant matter, mixed with saliva and beeswax, used to fill in unwanted holes inside the hive. Kind of gross, but pretty cool. Welcome to the farm little chickens! September 12th was a special day on the farm: we welcomed nine new chickens into our flock! The pullets (official name for young hens) were chosen by the Fourth Grade as part of their gardening curriculum. They picked Black Australorps, Easter Eggers (colorful eggs! ), and Black Cross Links. That brings us up to ten different breeds in the coop! Most hens start laying at around six months, so we should start to see eggs soon. Keep an eye out for them at the farm stand! She's on the fence about the new girls. The new girls were shy at first, but quickly got used to their new digs. We put up a barrier so that the older ladies could get used to their new coop-mates. It was only 75% successful thanks to some hens who like to jump. They new ladies must really have taken to their little enclosure because that's where they still like to roost at night! Silly chickens. Speaking of sleep, the little Black Australorps really like to dig holes, either for taking a dirt bath or a nap with friends. See if you can see them in one of their holes the next time you come by. Feeding time can get exciting. In the end all went very well and everyone gets along swimmingly. 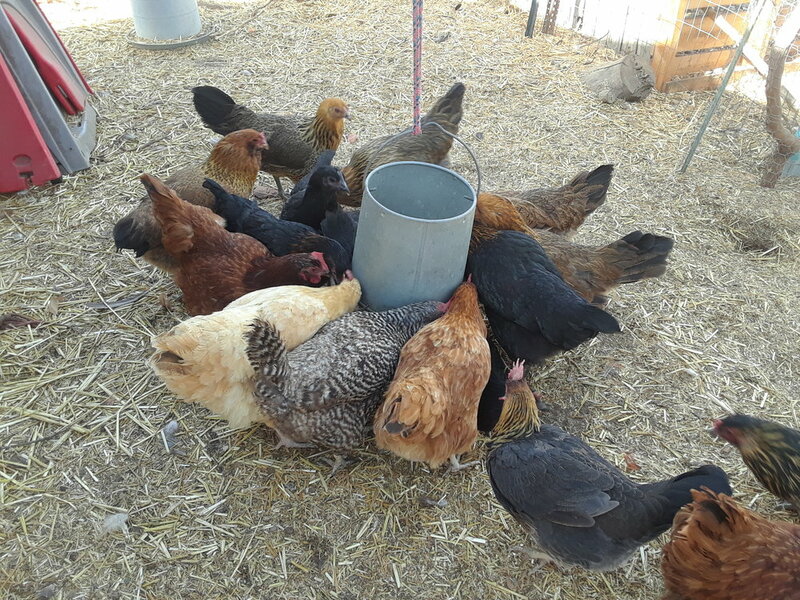 The pullets were adopted into the flock warmly, though sometimes the older hens remind them of the pecking order (a very real thing in the coop!). And now they spend every day together cheerfully, pecking their food, enjoying their “eglu,” and waiting for the ECC kids to come by and feed them weeds. It’s a pretty happy life on the farm.